It always seems to come down to the story behind the style. Without that, there is no substance, no narrative, no authenticity. It is why I am always digging to find that backstory for you, to experience, inspire and inform. For my own home, I may have a vague vision in my head, but as I am not a designer, it frequently takes me a while to find exactly what I want. And so it was when I was searching for wallpaper to create interest in my newly renovated entry. 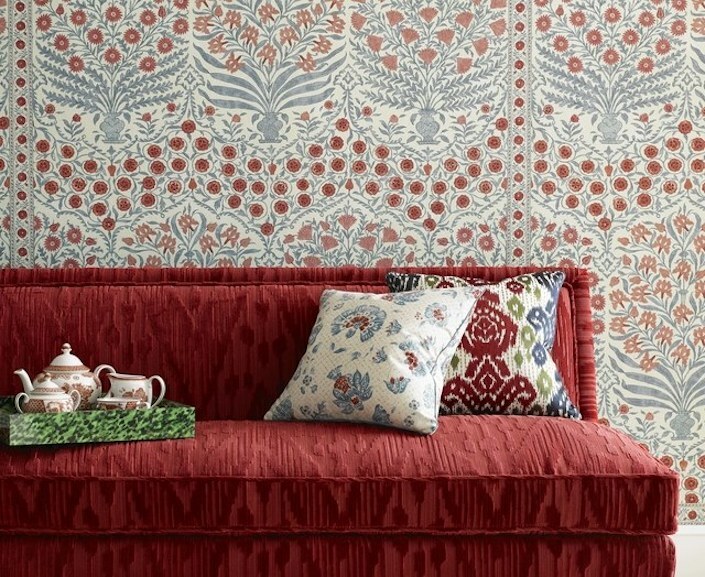 For months I combed sites and occasionally showrooms until one day I saw the new Oscar de la Renta III collection for Lee Jofa in their shoot for the collection below and knew immediately the beautiful Sameera wallpaper was the one. With the perfect pattern and scale for my space, below, and coloration to relate to adjoining rooms, its exotic yet classic flair elevates my (not yet finished) entry to another level. As we know, nothing is really new, it’s all in how it’s interpreted, which is why it’s so important to educate your eye. While much of this collection has tropical inspiration, this paper as I serendipitously discovered, has more Indian roots. When I first posted a peek of Sameera on Instagram, friend Gurmeet Kaur, who works with her sister Kuldeep at her company Serendipity Delhi, was kind enough to send me a link to what was clearly its inspiration, knowing I would be interested. 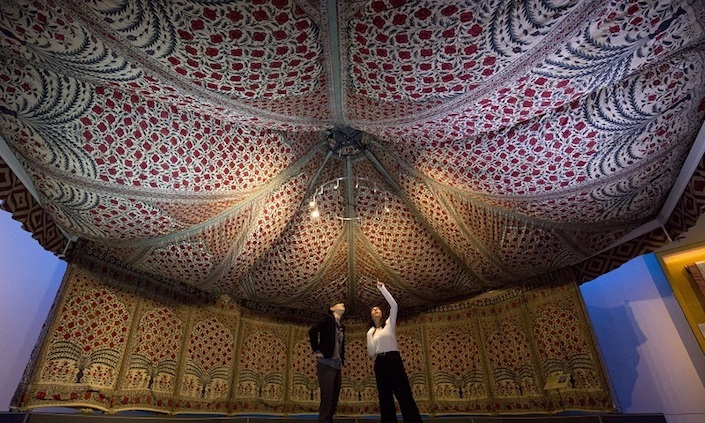 The 18th century Indian chintz tent below originally belonged to Tipu Sahib, the Sultan of Mysore in southern India, considered one of the greatest commanders in Indian history. As was the tradition, the court often travelled across its territories, simulating their royal homes with large elaborate portable tents. This is not just a Mysore tradition but was also the case across Europe. As you may remember from the tapestry exhibit at the Met, such itinerant courts wanted to not only travel well but display their wealth and power. Just as Napoleon developed his campaign furniture, so Mysore courts had their palatial chintz tents. 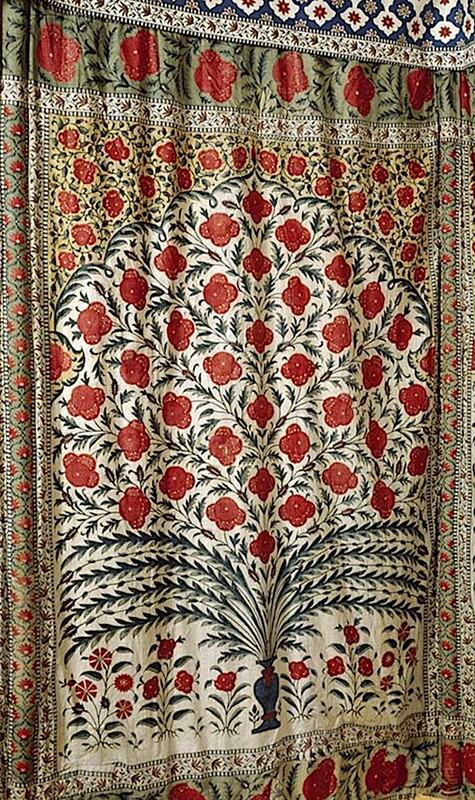 While Tipu’s tent, made of four separate sections, was plain on the outside, it was highly decorative inside with colorful geometric and Mughal floral patterns, above and detail below. When Tipu died, his possessions were divided among his enemies. The tent went to the 1st Earl of Powis who brought it to Powis Castle around 1800. In 1999, with help from the Art Fund, it was bought by Powis Castle and Garden and returned to the estate, now run by the National Trust. 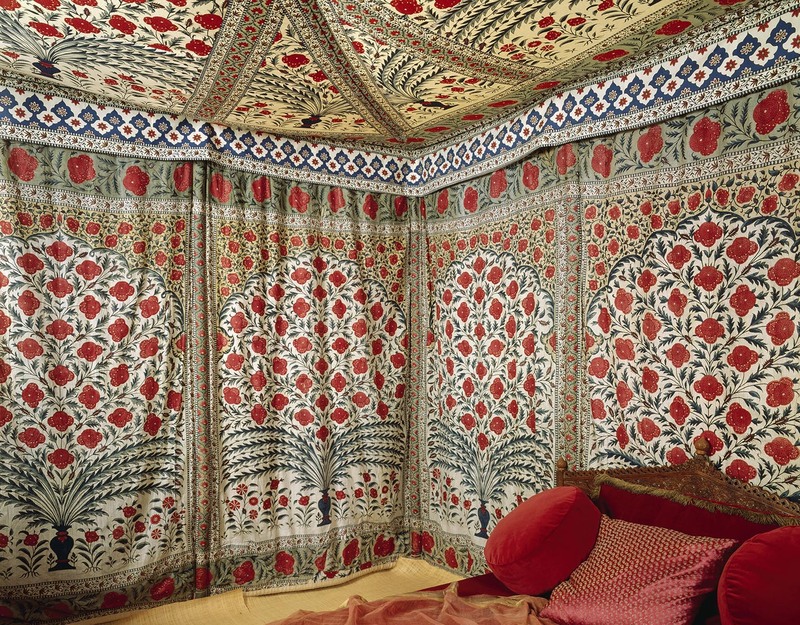 The tent was also featured last year in The Fabric of India exhibit at the V and A in London, below, to give you a sense of scale. This entry posted in art, art history, design, history, interior design. Entry Tags: interior design, Lee Jofa, Oscar de la Renta, Oscar de la Renta Home, Serendipity Delhi, Wallpaper Bookmark the permalink. Wonderful write-up and story. I was at the opening party for the Fabric of India at the V&A and the tent was simply magnificent and breathtaking. The night was even more magical as Peter d’Ascoli was in town, and since we’d never met, it was the perfect opportunity to meet each other there for the first time. Breathtaking! So much more interesting than the austere MCM trend. Marvelous. Absolutely love this! Inquiring at Lee Jofa. Thank you. 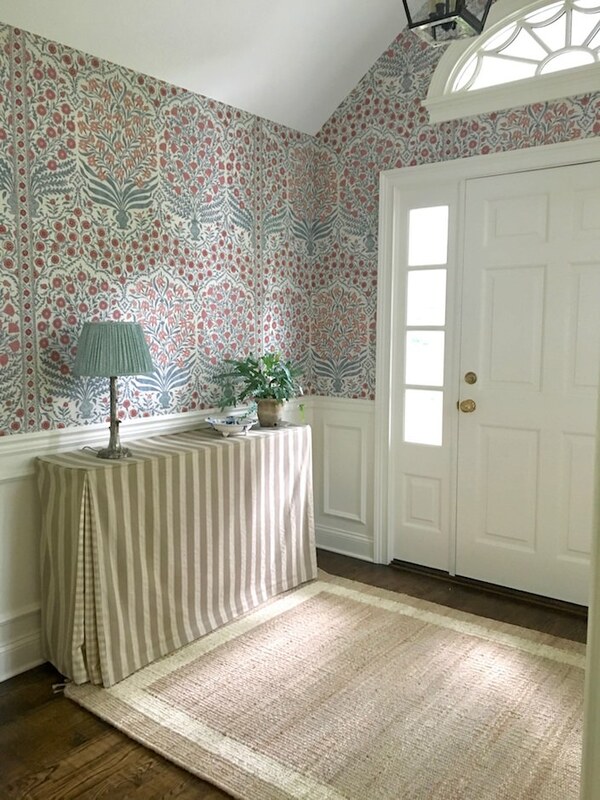 Such a fabulous print and I love your tracing the story behind it and your foyer. The beauty lives on in its many incarnations and honors the past. Arianne – as cited, that photo is from the Lee Jofa shoot for the collection. The fabric on the sofa is Caravan velvet in red. Thanks for the back story! Very interesting. Stacey, the tent is extraordinary, as is the story. I can see how the story would transport you to India, each time you walk through or near the area in your home, many times a day seeing that inspiring paper. I also love how you contrasted the paper in two ways, with straight lines in the skirted table, and also so quietly/gently with tone on tone Ikat type lines on the sofa upholstry, You are modest in saying you are not a designer, but indeed have a designer’s eye. I just love the fabric on that bench/sofa. Where is that fabric from? What a joy that entry is, and welcomes you home from your many travels. Marguerite – see my response to Arianne above – that photo is from Lee Jofa’s shoot for the collection. Thank you for your kind words! 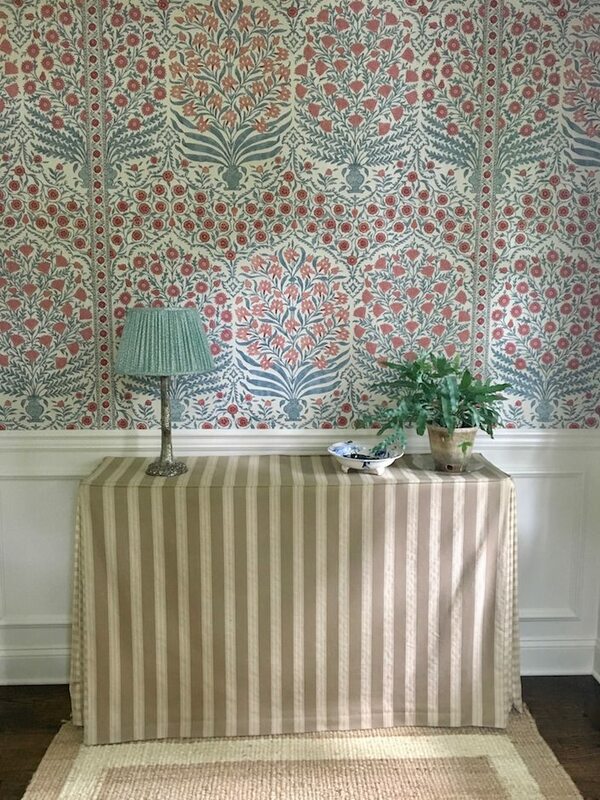 You would enjoy an afternoon spent in the Kravet/Lee Jofa studio. They have an amazing library of textile “documents” the are used to create new patterns. last time I was there they had an unbelievably beautiful antique tree of life piece that was in consideration for something. I’m sure they would love to have you! Lucky you, Stacey, having some semblance of that DIVINE tent in your wonderful entry hall (with such a right-on settee). And kudos to Joan Juliet Buck for providing such a compellingdefinition of appropriation! Beautiful print and story, thanks for sharing! You have created a visual and sensory feast with words. Thank you Stacy for sharing this great story and I love the personal angle. The new Oscar de La Renta Collection is layered with many interesting design references from lush crewels and fine embroideries to exotique palm prints. 86 queries in 1.338 seconds.